WASHINGTON — Holiday returns — an annual rite for millions of gift receivers that starts the day after Christmas — are easy with U.S. 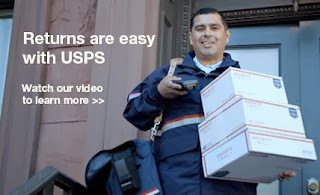 Postal Service.The improved shipping products and services from the Postal Service offer the easiest, most stress-free solution for returning gifts after the holidays. Priority Mail Flat Rate Boxes take the added hassle out of trying to determine the cost of shipping, with low flat-rate prices. Customers can pack their items in Priority Mail packaging available free at Post Offices. Or, they can order free Priority Mail packing supplies through usps.com and the Postal Service will deliver them — also free of charge. For the busy shipping season, the Postal Service exceeded holiday volume expectations with a higher than projected package volume increase — a double-digit jump over same period last year. The week before Christmas, the Postal Service delivered nearly 90 million packages with a daily average of 10 million per day for the holiday season. It handled more than 75,000 packages on Christmas Day. After closely monitoring mail volume early in December, the Postal Service adjusted its network and delivery schedule accordingly and delivered packages on three Sundays in December — the 8th, 15th and 22nd in high-volume markets.